When looking for a way to reach Machu Picchu, we found many options of tours and trails that bring right to the famous ruins, from trails like the Salkantay trail to vans leaving from the city of Cusco with whole groups of people to climb their way through. In general, short tours will take you 2 days and one night in Aguas Calientes, a small town on the foot of Machu Picchu mountain. The problem was, after spending 2 weeks traveling through Peru, we didn’t have much time left to spend in Cusco and as it is such an interesting city, full of things to do, we didn’t want to spend one night in Aguas Calientes. We needed an alternative for this, a tour to bring us from Cusco to Machu Picchu in one day. So why not try a private tour to Machu Picchu instead? As Cusco is located in a high altitude, I suggest you to spend some days resting in the city before you taking the tour, in order to avoid the altitude sickness. 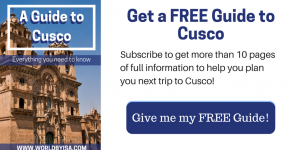 If you are planning to visit Cusco, don’t forget to get your free guide here! 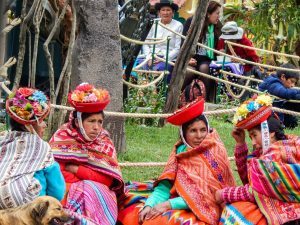 Peru Travel Explorer is a tour company that offers a variety of tours through the country, covering from the most mainstream destinations like Machu Picchu to not so well known ones like the Humantay lagoon. The cool thing about them is the fact that they are completely flexible, which is great when you are building your trip and wants to fit something in. In our case, we had only one day to visit Machu Picchu and many companies I was checking didn’t do one day trips, but Peru Travel Explorer offers both group and private tours, we went for the private tour, and the best part of it is that besides the comfort, you can do the trip on you own pace! From the tours they offer to Machu Picchu, there are private or group ones, from one or two days and for those looking for some adventure, there is also the trail to choose to get to the Machu Picchu, the trails are the Inka Trail and Salkantay Trail. Each option gives you a completely different experience of the trip. When it comes to visiting Machu Picchu, you have two options, enter the park in the morning, or in the afternoon. Our ticket was for the afternoon and as our tour was private we had time to enjoy the breakfast. Adrian, our driver, and guide through the road met us at our hotel and drove us all the way to Ollantaytambo, the city where we take the train to Aguas Calientes. The trip to Ollantaytambo was so comfortable, as it was only me and my mom in the car. This was the first time I ever took a private tour, and I must admit I adored it hahaha all the comfort and flexibility it gives is really relaxing especially at the end of a long trip through a new country! On the way, we could see many beautiful landscapes, admire the Puray lake, an important lake for the region, and from a distance we could see the Salineras de Maray. At some points, we stopped at a viewpoint from which we could see the Sacred Valley surrounded by the mountains and the famous Urubamba river, source for life in the region since the Inca Empire. 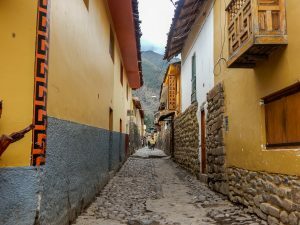 Arriving in Ollantaytambo, Adrian asked us if we would like to be dropped at the train station of at the main square, as we still had time until our departure, we decided to stay at the main square. Before taking the train we could still wander through the streets of the city, and enjoy our time among the locals, who were having a celebration that day. Ollantaytambo also has some ruins, you can take this time to visit it, as the ruins are located really close to the main square, however, you need to buy a ticket to do so. The train station is just 15 mins away from the main square, you can easily walk till there or take a tuk-tuk. The train trip is made with Expedition Service, they offer super comfortable trains with amazing panoramic views where you can see not only around you but also get an amazing view from the mountains thanks to the windows above you. The service also includes drinks and snacks on board. Arriving at Aguas Calientes train station, our next guide, Wilson that would guide us through the Machu Picchu, was already waiting for us at the entrance of the station. We took a bus to climb the mountain until the entrance of Machu Picchu park. I must say that Wilson is a really patient person, because the number of questions I asked him would drive most people crazy hahaha luckily, he was as passionate about the Inca history as me! In the end, I left Machu Picchu with no question unanswered! One of the things we learnt, and that many people might think like us, is that Machu Picchu is actually the name of the mountain which the city was built in, and not the big iconic mountain in front of it, which we see so often in pictures, that mountain instead is called Huayna Picchu, and can also be climbed in a separated tour. I must admit that walking around Machu Picchu, which is a really big area and going up and down the stairs is so tiring, so at the end of the day, you are physically done! Despite all the tiredness we still managed to take the free time we had after leaving Machu Picchu and walk around Aguas Calientes for a bit, before taking our train back. This was the first time I ever took a private tour, and I can assure you that people are right when they say that it’s good to be VIP! You pay a bit more, but it worths every cent, you have more freedom and flexibility in the trip so you don’t need to rush around following your group, also the comfort you get in a private tour is something incomparable. To be honest, I doubt that in a group tour we would have had time to visit so many things and learn so much on our way to Machu Picchu as we did that day. Another advantage is that you can ask as many questions as you want since you don’t need to be ashamed in front a big group, plus nobody will give you that “someone please shuts that human being up” kind of look. It is also a good chance to get to know a local (the guide) and learn directly from the source. Privates tours can be more expensive but in my opinion, there are cases where they are a way more attractive option than a group one, especially if you are going to such a historical and cultural rich site, where there is a lot to see and learn, private tours will give you more chance to absorb and enjoy the moment fully. Disclaimer: We received a discount to this tour, but as always, all opinions are completely my own. Great photos! Wonderful adventure! Thanks for sharing! Nice and very informative.great article. Definitely! I wish to go there again, it is really a magic place! hahaha you really should visit it someday!! I’m sure you will love it!! There was always something about Machu Pichu that makes me wanted to visit the place. Unfortunately, until now I still haven’t find the time to go, but it is definitely high on my ”to visit” list. thank you for sharing this great post! Thanks for the amazing info! I’m going to Machu Picchu on February 2018 🙂 SOOOO excited! That looks amazing! We really need to visit Machu Picchu soon! That tour looks and sounds great and you have beautiful photos! 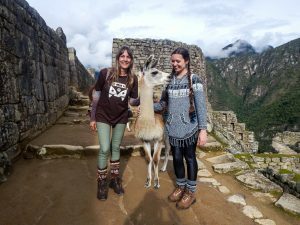 I would love to do this type of tour for Machu Picchu! I think you’re right that this would be the type of experience where the extra money is totally worth it! I will definitely consider this option for when I plan my trip! Thank you!! Looks like such an incredible experience! I have a friend who just got back from Peru and absolutely loved it. I’d love to go one day! Peru as a whole is magic! It has so many beautiful things to see, going there is truly a unique experience! Love your pictures, and great tips!! I didn’t know you could take a bus to Machu Picchu. I always thought you had to hike up there. It’s been so high on my bucket list though (and even higher now that I know I don’t have to hike for days). P.S. Your pictures look so dreamy. hahaha don’t worry, hiking up is not the only option to get there! Many people do that though, but I’m not such an athlete, so lazy option FTW! Everything looks so gorgeous in these pictures & it sounds like you had an amazing trip. Also, I really want to give that alpaca a huge hug! Having a private tour sounds amazing! I will keep it in mind for my travels in the future. By the way, I love the pictures you took. Some stunning photographs! Machu Picchu is 100% on my bucket list, it just looks stunning. Great piece and so are the pics. I haven’t been to Machu Picchu and now I definitely need to plan my next vacay to see this magical place! Exactly! I find it really worthy to take private tour for this kind of places! Yeah, it is definitely not a waste of money, specially for places like this, that has so much history and culture, so much to learn. With private tour at least, you don’t need to run around a group all the time. It gives you more time to appreciate things without rush and you are able to learn more as well! I love that you are traveling with your mom! Looks like an awesome time. That mountain view is gorgeous. I’m jealous! Wow! Machu Pichu is on my bucketlist! This is great post! Thanks! How wonderful and lucky to get to travel there with your Mom! I loved it. I would do a private tour as well. I’ve never been and would love to go. Amazing photos! Thank you. Amazing views. Beautiful photos! Thanks for sharing! Lovely. i really liked the post because its detailed and backed with excellent photographs. Great pictures and it seemed like a wonderful tour! I hope I get to visit this area sometime soon! Vibrant photos really capture the atmosphere! :) It is great that the tours were very flexible. I think this is important when you have a busy schedule of travelling. 🙂 Well done! Peru is an amazing country with its abundance culture. Definitely going to travel Peru one day. Thanks for the share. I want to go so bad! Great pics! Woow!Amazing place! I want to visit Peru! I haven’t thought this place is this awesome! Thanks for bringing me there through your pictures. You captured lovely places! Amazing! I’ve bookmarked this for later, it’s one of my dream destinations! This is insanely helpful! I am trying desperately to go to Peru and Machu Picchu next year! your photos are simply breathtaking! thanks for all the great information! I really want to visit Peru soon! This is amazing!! I visited Machu Picchu when I was younger, and I have always dreamed of going back. 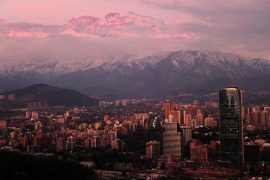 I would love to do a private tour like this, or do the Inca Trail. Thanks for sharing such an awesome experience! Thank you for all of the great information in this post. I am hoping to visit Machu Picchu in the spring and this is so, so helpful. What is the pricing? How big of a price difference is it between the private and group tour? 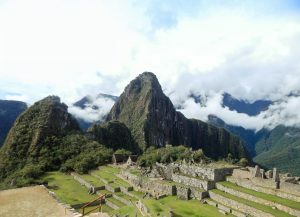 You will love Machu Picchu, it is breathtaking! Tbh, The prices are not so different, I though that it would be way more expensive but actually it was not. What is expensive in the trip to Machu Picchu is actually the ticket for the Machu Picchu itself and the ticket for the train. 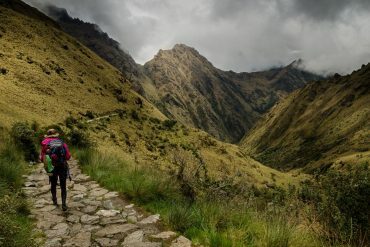 Amazing post, I just came back from Peru few weeks ago, and I did the hardest way to get to Machu Pichu (but also the cheapest), we hire the economic tour that include ride from Cuzco to Ollantaytambo then we walk for 3 hours through the train tracks, we found a lot of turist doing the same. Finally we get to Aguas Calientes and stayed 1 night there. Next day very early, we climb the 2 thousand steps to Machi Pichu, we had also few time, we did it in 2 days. This was a very hard way but definitely it worth it!.. Although if I ever visit Machu Pichu again I will do it at your way! hahah It was really an adventour! I heard of some people doing the same way as you. I could see on the way, when we passed by to the hydroelectric, some people walking following the train tracks as well, I would give it a try if I had time tbh! Peru is on our to-do list! But I don’t know if I’d like to be on a pivate tour. I think I’d prefer to be by myself!